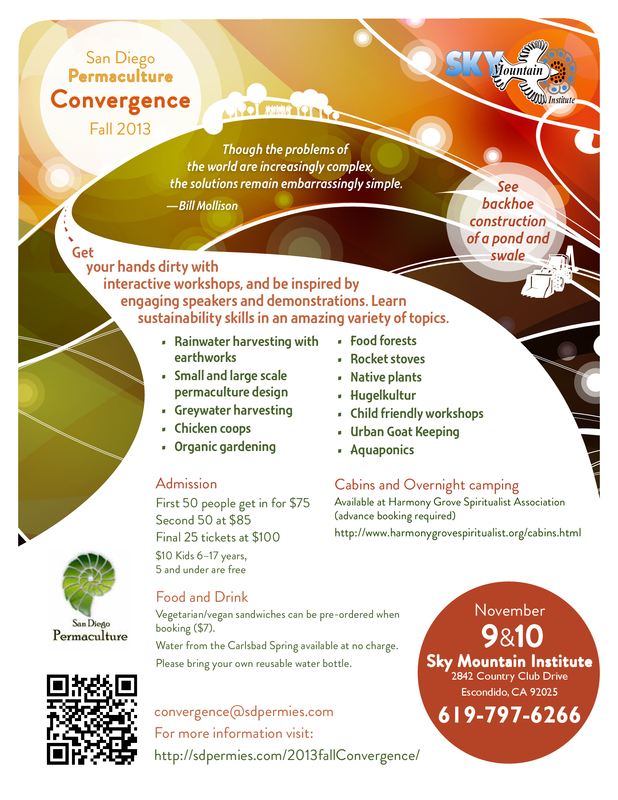 Southern California Permaculture Convergence! Be there! 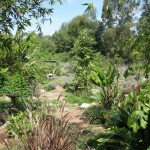 If you are interested in any aspect of permaculture, such as organic gardening, herbs, planting native plants, aquaponics, natural ponds, beekeeping, keeping chickens, and so much more, then you must come to the Southern California Permaculture Convergence. It happens on March 9th and 10th at the Sky Mountain Institute in Escondido. The keynote speaker will be Paul Wheaton, lecturer and permaculturalist extraordinaire of www.permies.com fame. Oh, and I’ll be one of the many speakers as well (cough cough). The Early Bird special of only $50 for both days ends at the end of January, and then the price will rise, so buy your tickets now! Also, for a full-on demonstration of taking bare land and creating a permaculture garden, there will be a three-day intensive class taught by Paul Wheaton on site the three days prior to the Convergence. You can read about the convergence here at the official website, which will give you the link perm.eventbrite.com where you may purchase tickets. 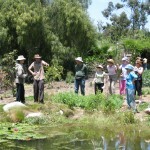 Also visit the SD Permaculture Meetup page to see all the free workshops that happen monthly all over San Diego. This convergence is such a deal, you really shouldn’t miss it! And such a bargain, too. One of the best things I find that come out of these convergences is the exchange of ideas and networking among the attendees, and all the practical information you can take home and use right away. 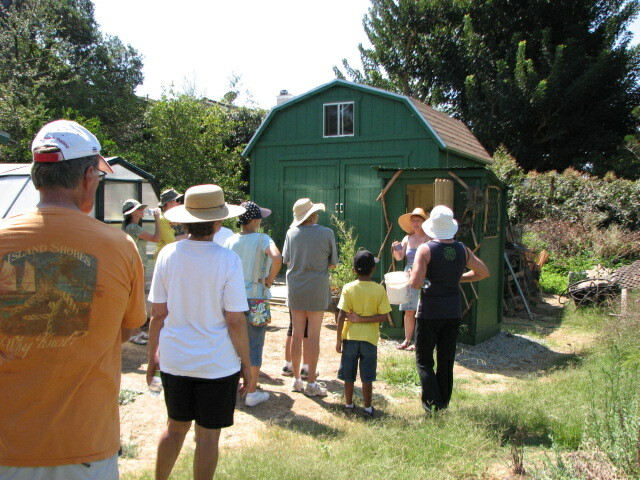 One of the largest parts of permaculture is building community, which means sharing with and assisting others. Really. Don’t miss this! Tell your friends! I am in sensory heaven. Outside frost is again settling – a rarity here in Fallbrook, CA. Inside…. mmmm. My daughter is juicing today’s harvest of oranges. On the stove I’m poaching the last of the Harry and David pears my son sent before Christmas, in a bath of Julian apple cider (I’ve had frozen since October! ), cinnamon and vanilla. There is a touch of woodsmoke from the wood burning stove. The mingled aroma of vanilla, orange and cinnamon in the air is incredible. In the fire are two homegrown potatoes in foil baking for dinner, and I’m cutting squares of homemade bread (it rained the other day… great baking and soup day!) to toast in the fire on fondue forks with mozzarella cheese and drizzled with Just Dip It (an olive oil, vinegar and herb blend from Temecula Olive Oil Co.). I am saturated with contentment and gratitude. I wanted to write a blogpost for the first day of the year about gratitude. 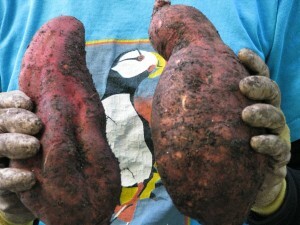 Instead I’m writing about harvesting yams and sweet potatoes, which, I believe, amounts to the same thing. Today the air was clean and almost 60 degrees F. Maxfield Parrish clouds filled the sky making it hard to pay attention to anything else. 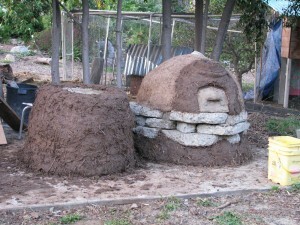 My daughter and I finally fired up Harry Mud, the cob oven. We experimented by baking small frozen pizzas, to success. Then in went homegrown, wrapped sweet potatoes, garlic and russet potatoes to slowly bake in the ashes. I hope I can convey sweetness of sitting outdoors on New Year’s Day eating pizza and smelling home grown potatoes and garlic cooking in a mud oven that we built, from mud from our property, as a snowy egret watched us carefully from the pond and our hens figured out how to beg. Peace. Enjoying the payoff of hard work. Eating health. In the last few days we’ve dug up several patches of yams and sweet potatoes, the greenery of which had just been frosted black. I plant them all over the property to fill the groundcover niche of the plant guilds. I also grew some in my raised veggie beds. Some of the sweet potatoes had been small last year and so I left them in the ground. They grew. This enormous one was six pounds! The flavor of homegrown, organic potatoes is beyond description. You don’t need sugar and marshmallows dumped on the yams; potatoes aren’t just a vehicle for toppings. I steam them, eat them with butter, salt and pepper. Phenomenal. On Christmas I roasted wedges of yams with garlic and olive oil, and not only were they terrific, the leftovers I mixed into a hash for breakfast and it was sensational. 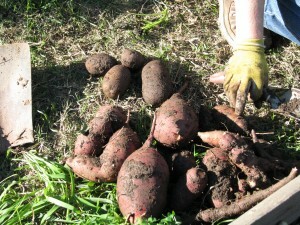 Yams and sweet potatoes are what Americans call the orange or white tubers, respectively, sold in the grocery stores. There are actually hundreds of varieties of sweet potatoes of many colors and flavors. They are semi-tropical and like warmth. To grow, buy an organic sweet potato or yam and allow it to sprout on your counter. This is the easiest way. You may also buy slips from organic growers. Please, please don’t buy non-organic seed, slips or bulbs. Please don’t be Round-up Ready. Colorful yams full of antioxidants. Take a sharp knife and cut slices from your sprouted yam, each containing at least one sprouted ‘eye’ , and lay them out to air dry for a couple of days in a cool, dry place out of direct sunlight. This hardens them off. 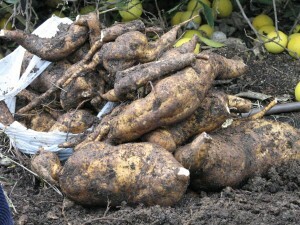 Don’t plant a whole potato because the plant will have all the food it needs to produce greenery and won’t feel the need to make as many tubers. Plant the slips in well-drained soil that isn’t heavily manured; as long as water doesn’t sit around the roots, they will probably grow. I’ve had luck in many kinds of soil. 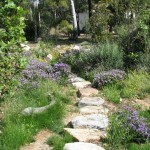 The plants will spread out in a lovely, glossy-leaved groundcover that protects the soil and reduces weeds. Let the vines run and enjoy the small yam flower. Harvest in late fall, or when the greenery dies off. 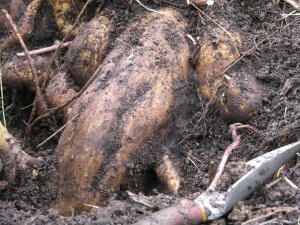 Carefully dig and lift the potatoes. The skin will be more delicate than on yams store-bought. 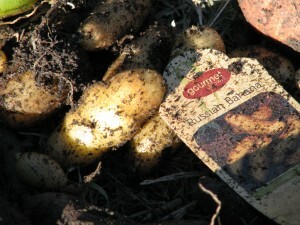 Lay the dirt-caked potatoes out to dry off before you store them in a cool dark place. Keep small slips and roots for replanting. The flavor of homegrown organic potatoes will make you wonder what the tasteless mushy things you’ve been eating have been. This last year had its share of terrible losses, worry, pain and disappointment, along with great joy and contentment if I opened my eyes to them. They say that you reap what you sow, and as the garden and my experience deepens, and as my life mellows, I feel the truth in it. This morning we had fresh juice made of passionfruit, guava, oranges and pomegranates, all of which we grew. The potatoes, garlic, squash, greens, pickles, passionfruit curd, strawberry jam, dried tomatoes, all are at hand because of planning, sowing, nurturing, harvesting and preserving or storing. This may seem incongruous, but I am astonished at how many friends I have gained this year, through my volunteer work and exercise classes, in addition to those gained while working with County Parks, Sullivan Middle School, and the SDZoo Safari Park. So many that I wrote out the names and counted and marveled. Perhaps the list would be small for others; I don’t know, but it is wondrous and enough for me. At age 51, I have more friends and good acquaintances than I’ve ever had in my life. I am so grateful. I not only reap what I sow, but just as in my garden harvest, I have more than I could have imagined. I do not follow a religion. In Buddhism it is said that life is a walking meditation; that every step you take is a prayer. As I put one foot in front of the other walking through the last part of my life, as I dig yams and eat them redolent with the health of good soil, as I watch those Maxfield Parrish clouds, as I laugh and work with friends who miraculously smile when they see me, I wordlessly pray my gratitude to the universe. I very truly wish for you a year filled with gratitude and peace, and health-giving food that nourishes your heart and soul as well as your body. The project: tire table and Harry's hat. When I moved to this property thirteen years ago, I inherited a lot of ‘leftovers’ from the previous owners. Included were three truck tires, one with the wheel. 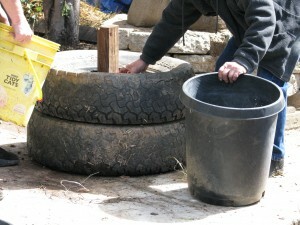 I’ve used them over the years to block a hole under the fence to keep my dogs in and to direct rainwater. When rolling them once again across the property to hide them, I realized that they needed to be re-purposed. If I stacked all three tires together, they’d be just tall enough to be a table. And a table is just what I needed next to Harry Mud, the cob baking oven. 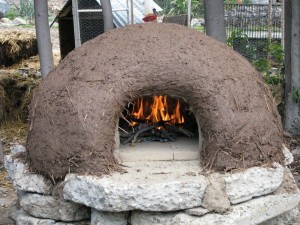 Cob, you remember, is an olde English term for building material made of sand, organic material and clay. 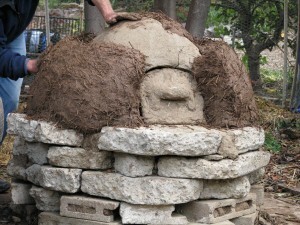 I wanted to demonstrate cob building material at the AAUW Garden Tour, so earlier that week I cobbed. I also wanted to add a chimney (or stovepipe hat!) to Harry, since I found a piece left over from my wood burning stove. The chimney would direct smoke up rather than out the front and into one’s face. 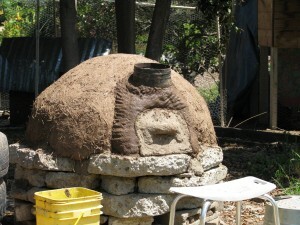 A chimney isn’t essential for a cob pizza oven, but it can’t hurt. Harry's fancy new stovetop hat, in progress. I built a sand base to represent the new hollow space in front of Harry. I cobbed around the sand, and around the top hat (stove pipe). Joining wet cob to dry cob can certainly be done; I moistened the dry cob slightly first and had no trouble with separation with this small project. I sifted some dirt, but then realized for this layer I didn't need to. 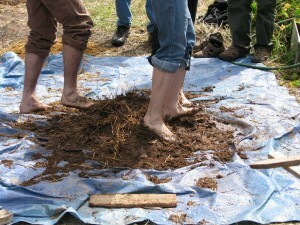 Cob can be done on a tarp, which helps mix the ingredients when you pull the ends towards you. Making cob is simple and everyone can enjoy it! Broken bottles joined bits of rubble and sand as filler. I began to cob around the bottom of the tires, making a thick base. I kept mixing and cobbing, making sure to push the new layers of cob well into the one below so they wouldn’t crack and fall off. The work area; about 85 degrees that afternoon, too. I was trying very hard to make a mushroom-shaped table, but I failed completely and settled for a cylinder. This layer is shaggy with straw because I needed very firm cob to hold together, since it wouldn’t adhere to the tires. Another time I’ll put a smooth, decorative slip coat on both the table and Harry. The cob was done for the tour and there were many interested people looking it over. 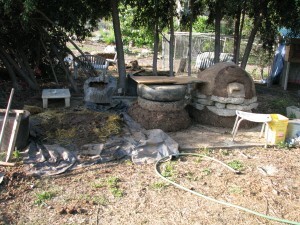 I especially saw many husbands shrink into themselves as their wives grew more excited about an outdoor cob pizza oven! 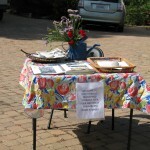 Cob table and Harry's hat, with information sign for Garden Tour. I Went to a Garden Party…. 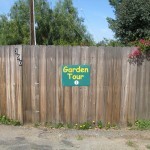 Saturday was the AAUW Garden Tour. What a glorious day. 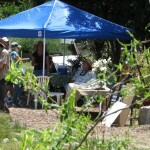 I expected about a hundred visitors, and made 120 handouts. Sometime in the early afternoon I guess they ran out, and I didn’t know about it for awhile. I made 25 more for the last two hours, and have five left. One of the docents said that some had been turned back in during the morning. Every couple probably took just one… wow, that’s a lot of people. I’d been talking to the garden all week, asking the blooming plants to hold that thought for a few more days, and encouraging the nonblooming ones to get a move on. The plants did what I asked! There were so many flowers out Saturday, it was amazing. Heirloom roses, Gideon’s Trumpet, ranunculus, herbs, wildflowers, and waterlilies. The garden, apparently, also was also all for proof in advertising, as in standing behind the NWF Habitat sign on the front gate. So many kinds of butterflies and dragonflies were out for the first time this year that people remarked on it. In the afternoon, there were sightings of a king snake all over the property; I think it had to have been three kingsnakes. One was moved from the refreshment area, but he came back, and then as I was standing by the pond talking to some ladies one came past us. Another was sighted up in the driveway. Roger sighted a gopher snake. No one shrieked or complained; either these were hardy people, or the idea that this was a habitat yard made them keep calm. It also backed up my claims of letting snakes deal with gophers and rodents! 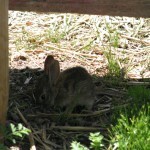 One man spotted a baby bunny under the Withy Hide bench. By one o’clock, it was funny. It was as if a button had been pressed to turn the garden on, and all the features were working! What a glorious day. Jacob (Aquascape Associates) and Roger (landscape architect) and I answered questions for most of the day; the last four visitors left at four. So many people asked questions about permaculture, soil, beekeeping, cob ovens and rain catchment that I know that I couldn’t answer everyone’s questions. Of course there were some who like a tidy, orderly garden, and that is fine. If everyone came away with some idea how to work with nature rather against it, to use chemicals less, to grow organic food, to repurpose, to compost their kitchen waste and weeds, then what a lot of small ripples of good will come of it. Thank you to my dear friends who helped prepare the garden so that it looked stunning. And thank you to the snakes, butterflies, bees, dragonflies, birds, bunnies and who-knows-what-else that came out to perform for the visitors! And thank you to everyone who visited! No casualities; all good. Welcome! Look at photos of how it was. A green melon under variegated lemon, with native grasses. 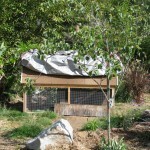 Quail hut, with privacy boards up. 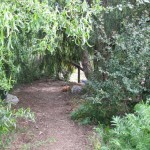 This morning a Meetup was held at my property (Finch Frolic) for the San Diego Permaculture group (http://www.meetup.com/SanDiegoPermaculture/ ). 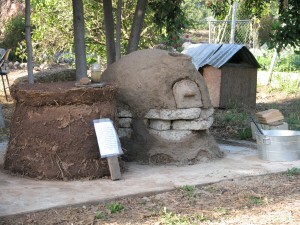 The agenda was to tour the garden and build the second layer – the insulation layer – on Harry Mud, the cob (earthen) oven begun at a similar Meetup last July. 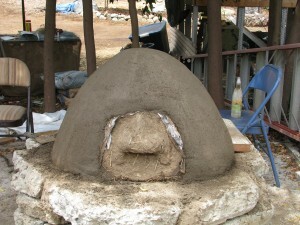 There are three installments posted on my blog; you can search for cob oven, or read about the third installment here: http://www.vegetariat.com/2011/07/cob-oven-3/ ) (sorry, I can’t seem to get the hyperlink to work). During all this time Harry has patiently sat under his tarp awaiting a second layer. Today was his day. One of the reasons I wanted to work on Harry is that my garden will be on the Association of University Women’s garden tour on May 12th (OMG! Only four weeks away!!!). 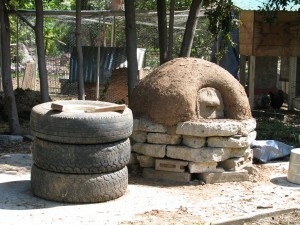 I’m hoping to inspire a lot of people to research permaculture for their own properties, and to show off earthen building. Harry will be a star. With 29 people signed up to come today and projected rainshowers, I scrambled a bit to make sure there would be cobbing opportunities for all. However about 15 people toured, the weather although windy was dry and beautiful, and all goals were accomplished. Hopefully everyone came away with what they wanted to hear about, and not so much dog poo on their shoes. 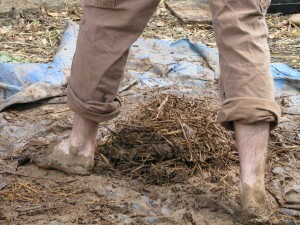 A dirt and straw pedicure. Although I enjoy speaking with groups of people, the drawback is that I don’t have the chance to speak with individuals and find out their stories or learn from them. 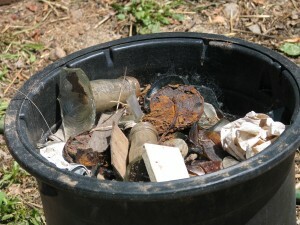 Everyone has wells of experience and tidbits of knowledge (or buckets full! ), and you never know how your life can change with just a passing comment or chance encounter. Anyway, many of us had mud manicures and pedicures, the group dwindled, and Harry became even more handsome, if that is even possible. Three intrepid souls stayed for Harry’ First Fire, and we lunched and chatted about all kinds of interesting topics, such as communication between plants. It was a good day. Now that I’ve soaked the mud off of myself in a hot bath with epsom salts, I’ll show you what went on. 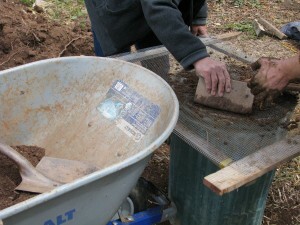 Sifted soil in wheelbarrow being resifted through smaller mesh. To create the insulation layer, we sifted dirt through two progressively smaller screens. That was mixed with water and a lot of straw, which took a lot of time but was fun. Fancy cob footwork. 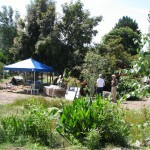 Cob is a community event. That cob mixture was formed in a four-inch layer around Harry. Harry looks as if he's going bald, but he's actually getting a straw afro! Just in case all 29 people showed up, I had prepared an extra cob project. I thought a work table next to the oven would be a good idea, so stacked two old tires, topped by a tire with the wheel still in there. These had been part of the fill on my property when I moved in 13 years ago. Two intrepid permaculturalists then filled the inside with rubble (small bits of urbanite left over from walls) and sand left over from Harry Mud. A piece of wood was propped in the center to hold the top in place. At some point the entire thing will be cobbed. 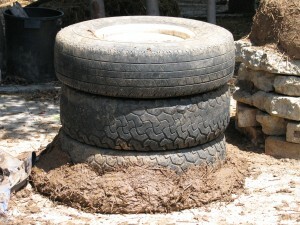 Filling stacked tires with cement rubble and sand for future cob table. Harry’s First Fire was set. Handsome, isn’t he? Harry Mud, all fired up! He is a little thicker towards the bottom (I know how he feels!) because the mixture slumps a little, but he’s thick enough all over to insulate well. Harry will eventually receive a slip coating on the outside, which will help protect the insulation layer and be decorative. The urbanite base will be covered as well. I’d like a shade structure over the area, built out of the shed leftovers of which I have plenty. Harry will have to be protected from rain by a tarp as usual. Thank you everyone who helped out! 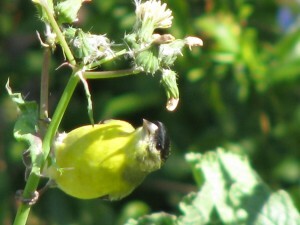 Lesser goldfinch eating sow thistle seeds. Good soil is the basis of life as we depend upon it. Rich, loamy soil with a neutral pH is what every gardener dreams of. The smell of fresh soil is called geosmin, which is a scent released by happy soil. Good soil makes for healthy plants, which in turn grow healthy fruits and vegetables. Soil is different than dirt. Dirt is what happens on a roadway after a lot of traffic passes over it and the oxygen is compressed out of it. 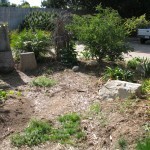 Dirt is what is left when erosion is allowed to carry off topsoil. Dirt is what remains after unsustainable farming practices where chemical fertilizers are dumped onto plants year after year until nothing will grow anymore. Dirt is what most people have when they move into a new house, because to make the property level all the topsoil has been scraped off and buried. Dirt is nearly dead. 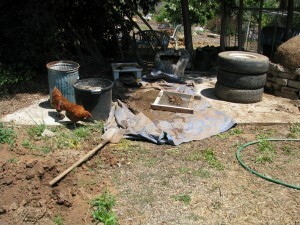 But dirt is an ingredient in soil, and luckily Mother Nature is always trying to repair the soil. What we call weeds grow in dirt because these are plants on a mission to bring dirt back to life. Plants have different jobs in nature. Some have deep tap roots to mine minerals from deep down, bring them up to their leaves which die and transfer the minerals to the surface. Some are groundcovers. Some attract insects. Some fix nitrogen in the soil. 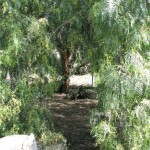 Some provide a shady canopy. 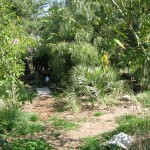 Most provide mulch in the form of fallen leaves, twigs, flowers and fruit. Some provide habitat for animals, whose droppings fertilize the ground. Plants help each other in a symbiotic relationship, and permaculturalists call a set of these plants guilds. Now look at weeds in a vacant lot and try to identify them. Wild radish? It has an enormous taproot that breaks apart hard soil, then mines deep minerals and delivers them to the topsoil in the form of leaves. 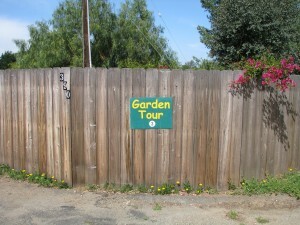 It also attracts bees and other pollinating insects. As does mustard, which has a very tough root system that also breaks up hard soil and creates tunnels for worms and other soil creatures to move through. As the plants die off, so do the roots, which decay and feed the microbes and worms, whose castings turn dirt into perfect soil. Grasses hold onto the soil keeping it from eroding away, shades the soil from harsh sunshine, retains water and provides good habitat for worms as well as food for birds, depending upon what type of grass is growing. All plants have a purpose, even if they aren’t in their native environment. However we don’t want our gardens to be like vacant lots. Usually, quite the opposite. Many people will look at their backyard full of weeds and poor soil and decide just to dump white sparkly rock all over it and stick in some unhappy cactus. These people are actually much kinder to the soil than those who start the relentless, expensive, laborious and deadly cycle of spraying chemical weed killer, dumping on chemical fertilizer, forcing plants to grow in areas not suited to them and yet never creating soil. 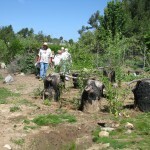 When you use permaculture practices in your garden, the most work is done in the first year. You plan your garden for functionality, plan plant guilds, plot out your own usages and desires, and then plant accordingly. You may plant close together, but keep in mind the needs of the adult tree. 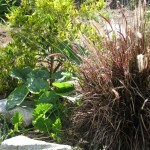 Don’t plant invasive plants unless they are properly contained. 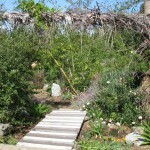 Don’t plant vines without installing support systems such as trellises first. 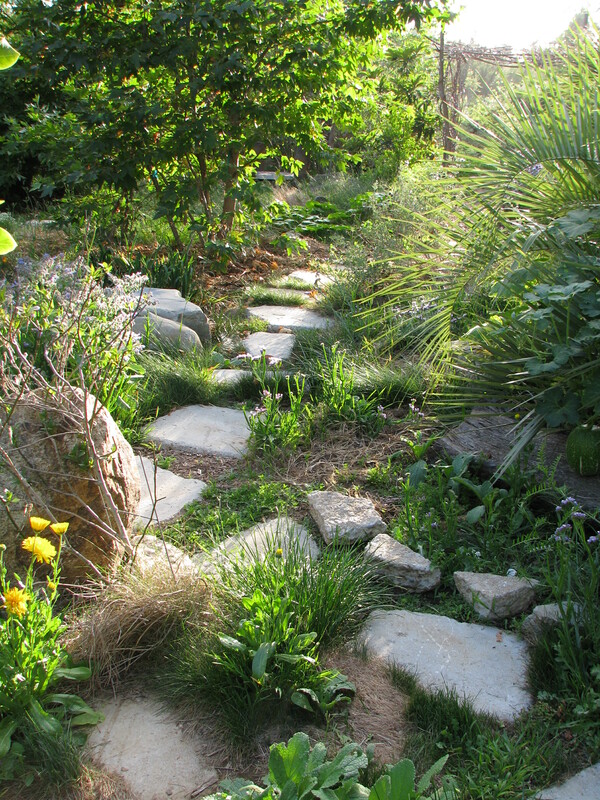 Lay the groundwork for your garden. Don’t spray. Don’t pour lots of money into chemicals. Don’t even till unless your soil is horrible and you can’t wait to plant (and then, only till once and then never ever again!). There is a lot less physical labor to do in a first year permaculture garden than one with chemicals, and none of it involves poison! 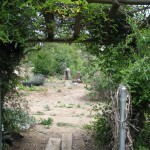 Permaculture makes you look at everything in different ways, even things that conventionally seem bad. Instead of looking at your weeds as devil spawn, look at them with a view to what their purpose is in the garden. What are they telling you about the soil? I’ve talked about this in earlier posts, about what type of soil supports different types of weeds. For instance, nettle grows in high nitrogen areas. Now think of the weeds as a potential crop. Lambs quarters, purslane, even stinging nettle are all edible (boil the nettle briefly to dissolve the acid) and very healty for you. Dandelion wine! Or think of the medicinal values. Watch your weeds for awhile. Do birds eat the seeds? Are they covered in ladybugs? So now that you know your weeds a little better, you may think more fondly of them and perhaps allow some of them to live. 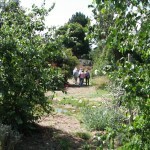 Or even reserve a corner of the property for weeds to grow just for those birds, insects and your own harvesting. I’ve allowed purslane and scarlet pimpernel to grow over newly planted areas because they helped hold the soil, preserve moisture and helped prevent more nasty weeds from growing. Now you’re thinking: but what if they reseed? Well, of course they’re going to reseed unless you don’t let them live that long. Seeds are coming onto your property via air, animals and your own shoes every day. There is a horror about reseeding weeds that is all blown out of proportion. Have you ever cut all the weeds and had none come up the next year? Only if you dump Roundup or other chemicals on plants and kill them and everything around them in an annihilation of all that’s good along with all that you don’t want, do you keep anything from growing in that area. So how do you get rid of weeds? Okay, hold that thought. 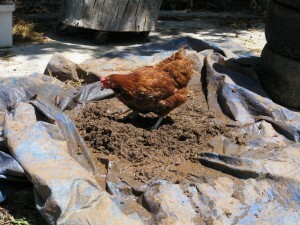 How makes up good soil? Decomposed organic matter. It is actually the microbes and worms in the soil that make soil alive and healthy, and they are decomposing all that organic matter. How do you get good organic matter? Haul truckloads of horse manure from a farm? Save kitchen waste? Have a worm bin and harvet the castings every six months? Wait until trees are mature and harvest the leaves? Well, yes to all of these, but in the meanwhile, as it often is in nature, the answer is right in front of you: the weeds! That’s right! Weeds are just compost that hasn’t happened yet. The fastest way to develop good soil when you have no other resources (or not enough resources) is to help nature along. Define your walkways (where foot traffic will compress the soil and where you don’t want anything to grow), and then when you pull weeds, toss them in your garden beds. If you weedwhip or mow, rake the cuttings into the beds. If you do this prior to the weeds setting seed, fine, but don’t lose sleep if you haven’t. You’ll grow some more weeds… great! 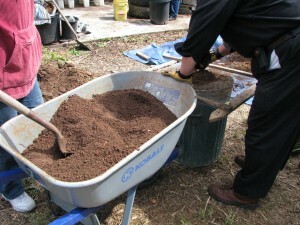 More compost! I hand pull most of my weeds and then throw them in the guilds under the plants, root ball up. Within a few weeks they have decomposed, and all those nutrients they were holding in their leaves and roots have been delivered to the soil in the same areas. (If you have different types of soil on your property, keep the weeds near where they grew because they were busy amending that particular soil). 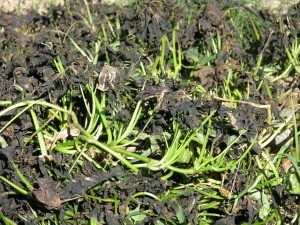 The layer of weeds will also suppress other weeds from coming up, and will hold in moisture. Sure beats hauling weeds to a compost heap, and certainly beats having the trashman haul off plants that are holding nutrients from your garden soil! There are exceptions to this practice. Invasive weeds such as Bermuda grass, Johnson grass, and anything that spreads via underground runners (rhyzomes) should not be handled this way. 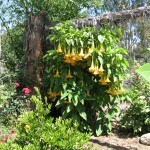 These useful plants for a vacant lot are terrors of your garden. However they can become useful. If you have a compost heap that really heats up, you can cook the weeds in it. What I do is put the weeds in an old trashcan, put the lid on it and let it sit in the heat for weeks until the weeds are cooked and completely dead. If it is Bermuda grass or Johnson grass, I also pound a stake through its heart. Then I compost it. Putting it in a trashbag works, too, but then you’d be contributing to the plastic industry in one more way and also to the landfill. I have set out trashcans with Johnson grass in it to go to the dump when I had so much that I had no place to cook it, and figured that sending organic weed material to the dump really can’t hurt. How does one get rid of invasive weeds without spraying? Relentless hand-pulling in combination with occlusion, which is covering it with plywood, thick layers of cardboard, black plastic or whatever you have that will deprive it of what it needs to live. This has been a long, lecturing post, and I apologize (if anyone actually has read to this point!) . I want you to look at the varied functionality of everything in the garden. If you have a problem, can you turn it into a benefit? For instance, if you have a wet clay area, why not harvest the clay from it to build a cob oven or garden feature, and let the depression become a natural pond? Or sheet mulch that area (what some people call lasagne mulching), which I won’t go into here but simply search the Internet for it and you’ll find hundreds of examples. Or plant peppermint or spearmint, or some other wetland-loving plant such as watercress… all of which are edible.